Andy Weber currently holds the post of Senior Fellow with the Belfer Center for Science and International Affairs at the Harvard Kennedy School. He also holds the position of Head of Global Partnerships at epidemic forecasting pioneer Metabiota. He is the former Deputy Coordinator for Ebola Response at the U.S. Department of State. In this role, Andy led diplomatic outreach efforts to ensure a speedy, effective and truly global response to this crisis. He has also served as Assistant Secretary of Defense for Nuclear, Chemical and Biological Defense Programs, and an Adviser for Threat Reduction Policy in the Office of the Secretary of Defense. 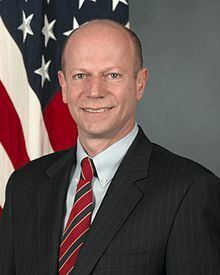 He played a key role in the Nunn-Lugar Cooperative Threat Reduction program, and as a Foreign Service Officer he undertook diplomatic assignments in Saudi Arabia, Germany, Kazakhstan, and Hong Kong. Weber also oversaw and developed the Defense Threat Reduction Agency. He was twice awarded the Defense Exceptional Civilian Service Medal. From 2002 through 2008, Weber taught a course on Force and Diplomacy at the Edmund A. Walsh Graduate School of Foreign Service at Georgetown University. He has a Master of Science in Foreign Service degree from Georgetown and is a graduate of Cornell University. He speaks Russian and is a member of the Council on Foreign Relations.